When it comes to search engines, at the moment nothing beats Google. Today I was playing with a tool that Google has added to its search results pages ... a Search Site option. 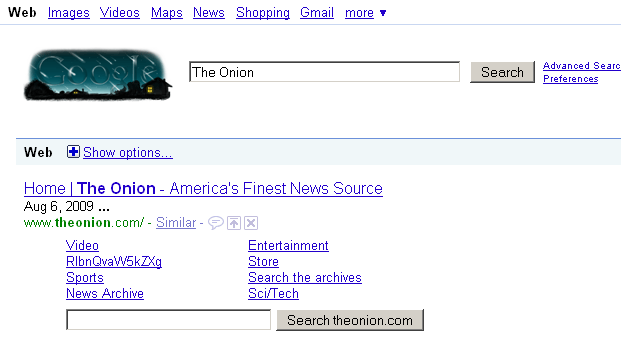 I was looking for a particular story on the world's greatest satire site, The Onion, and so I did what I always do. I typed the headline, best as I remembered it, into the Google Search box in Firefox. I was treated to this sight. So I got to wondering ... is this a new feature of Google's paid service Google Site Search? This is Google's corporate search engine SaaS offering. Companies can embed a Google search box on their Web sites and pay Google to do the searching and return the results. (Google also offers on-premises search appliances.) The best way to check if this was such a paid-for feature was to search on the one company I knew would never pay Google for anything such a search feature. So short answer, no. This can't be a strictly paid-for service. Addition 8/13: Google confirmed that this feature, which has been available on Google for select sites for a couple of months, is not a paid service. The mini-search box is a feature that occurs during specific searches, when the Google algorithm detects "a high probability" that a user wants more refined search results within a specific site. According to Google: "Like the rest of our snippets, the sites that display the site search box are chosen algorithmically based on metrics that measure how useful the search box is to users." Which got me thinking. What criteria would Google use to add the site box? Most searched sites? So I tried one that is searched all the time ... "Google." Nope, no search box. I tried the About Google URL, too (it sports a "Search Our Site" box on top), but the Google.com domain doesn't cut it for in-results Site Search boxes. 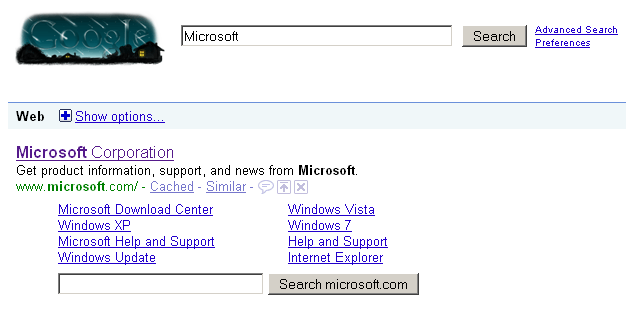 Search Site is a feature that has always been available via the Google Toolbar. It is one of the reasons Google became so popular in the first place. Plus, Search Site has been available for sites that use the Google site map via the "site:" command typed into the search box. (For instance, if you type this command into the box search appliance:site:www.google.com you will get a results page on search appliances on Google.com). But in the race with Bing, Google is bringing more of its tricks and techniques front and center. If you got 'em flaunt 'em. This story, "Search Site Box: Yet Another Reason to Love Google" was originally published by Network World.